Official description Bombs are everywhere in this explosive battle. Bomb-fest (大爆発大会, Great Explosion Contest) is the 3rd event match of the 51 event matches in Super Smash Bros. Melee. As an available character of their choice, the player must win a stock match against a team consisting of a CPU red Link and a CPU pink Samus. 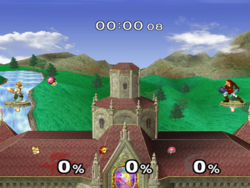 This event match takes place on Princess Peach's Castle and has no time limit. Every character starts with 1 stock. As its name implies, this event match features a large number of explosive elements. Link's Bombs and Samus's Bombs are frequently used by the CPUs' AI. The selection of items is limited to Bob-ombs, Motion-Sensor Bombs, and Poké Balls that only release Electrode. Banzai Bills also appear as a stage hazard. The Motion Sensor Bomb trophy is awarded for clearing this event match. This is the only time in Melee that the debug CPU modes SPLWLINK and SPLWSAMUS are used. Due to Link and Samus favouring their down specials, Electrode being the only Pokémon to emerge from Poké Balls, and the Motion-Sensor Bomb/Proximity Mine trophy being the award, this particular Event Match can be seen as a precursor to Super Smash Bros. Ultimate's Spirit Battles. This page was last edited on April 11, 2019, at 05:58.